~ Friday, March 9, 10:30 a.m.
~ Friday, March 9, 1 p.m.
~ Saturday, March 10, 11 a.m.
~ Saturday, March 10, 2 p.m.
Order tickets online at ontheboards.ca or by calling The Refinery Box Office, 653-5191. Tickets are $5 in advance or $7 at the door. Children under two are free. Singing with Sylvia shows are perfect occassions for families to sing and laugh together. 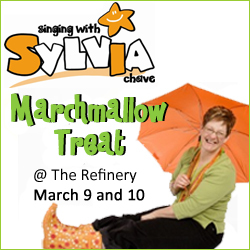 Children ages two to six will undoubtedly adore Sylvia's tunes, costumes and antics. Sylvia will be singing several songs from her new CD, The Orange Album, now available for sale online and at The Giggle Factory. For a chance to win a CD before the show, click here. One lucky saskmom.com follower won a pair of tickets to the show of her choice by entering the draw below, which is now closed. To enter, participants shared their favourite way to treat themselves. Read on for some great pampering ideas!